Storage space always seems to be at a premium, especially in small-scale urban apartments. Worse yet, many people are beholden to their rental agreement, so they don't have the means to do a full-scale remodeling project. Luckily, you can use side cabinets and medicine cabinets to revitalize the look of your washroom. 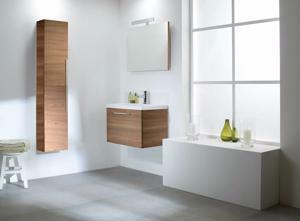 If you have a bathroom vanity, you can create a streamlined look by using two side cabinets in a matching hue. This will provide a spectacular place to store toiletries, towels and other items, or you could choose to take the doors off and use them as a display case for decorative accents. Floating wall shelves are another fabulous means of providing storage and a display area for your beautiful pieces of décor. They can be painted in any color and can attach directly onto your walls to provide a stable surface. Consider placing one over your toilet to display a few flowering plants and infuse a natural aesthetic into your space. These small additions can add up to copious amounts of additional space that will make your apartment bathroom far more versatile. What space-saving tips do you have for new apartment dwellers?